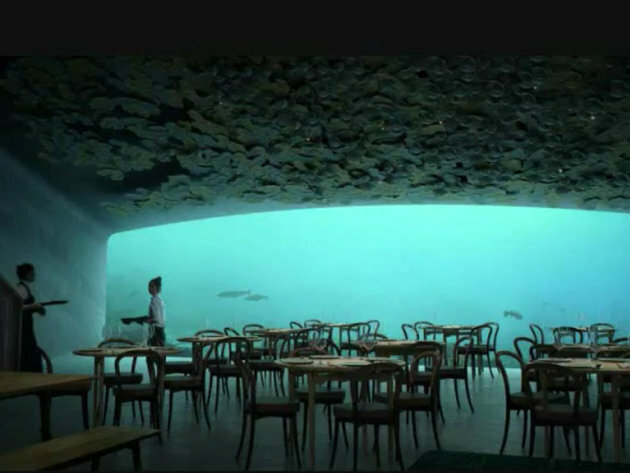 Europe’s first underwater restaurant opened in Norway on Wednesday with more than 7,000 customers booked in to eat among the fish. Situated on the southern tip of Norway, the restaurant looks like a large concrete tube partly submerged in the North Sea. It is called Under, which also means “wonder” in Norwegian, Reuters writes. – The fascination is just this movement from above water to underwater through the building ... The big window exposes the underwater not like an aquarium, it’s the real thing – Snoehetta’s founder Kjetil Traedal Thorsen told Reuters. Traedal Thorsen said the construction can cope with very harsh weather and is shaped in such a way that it can withstand what he called “the wave of the century”, Reuters reports. A full 18-course meal, based on local ingredients and seafood, can cost up to 3,700 crowns (USD 430) per person including drinks. – The goal is to get 50 percent of the guests who eat there to spend the night in the hotel as well... We expect around 12,000 people eating dinner every year – said Gaute Ubostad, one of two brothers who own the restaurant and a nearby hotel.